*Dipawali or Diwali is the brightest of all Hindu festivals. 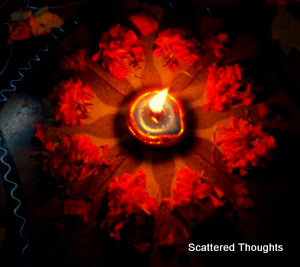 It’s the festival of lights ( Sanskrit dip = light and avali = a row i.e., a row of lights) Dipawali is celebrated in autumn. Human beings are the legates of their past good and bad deeds which either mar or mark their existence on earth, either through fortunes or misfortunes. It is believed that an escape from this is impossible. Dipawali or Diwali is celebrated all over India and Goddes Lakshmi and in some places Goddes Kali or Shyama is worshipped. To know visit this page. Beaitiful haiku. Hope you had a great Diwali. Its a wonderful festival of Lights. And Smoke, dense smoke, booms and bangs of intensely powerful crackers. Dead sparrows, pigeons. Dog and cows without their eardrums. Despite all these I loved your way of celebrating. Enjoy. Lovely picture Maniparna and good selection of words. A wonderful festival: the triumph of light over dark. happy diwali Maniparna 🙂 Hope you had a sparkling one! A sweet haiku tribute to celebrate the brightest festival! Have a wonderful Diwali celebration! Ah Divali … a wonderful festival … you have caught it so well in this haiku Maniparna. Thanks for this great haiku and the explanation of Diwali! 🙂 Have a great feast.